Moniker Art Fair opens tomorrow, and it’s making history in the art world by embracing Bitcoin payments. With over 80 artists displaying their work at the Old Truman Brewery, the fair will show off the best in contemporary art & urban culture as part of London’s Frieze Week. Visitors to Moniker Art Fair will have the opportunity to learn about cryptocurrency through a 50 ft interactive installation titled ‘The Renaissance is Now’. The installation will include a Bitcoin ATM for anyone inspired to try out the digital currency on the spot. Focusing on the concepts of decay and change, the space conveys how decentralised technologies such as Bitcoin can potentially offer society a future of hope and abundance and a real alternative to the current Fiat system. I discovered Sara Pope on Instagram, and I reached out to her to learn more about her participation in the Moniker Art Fair. Pope’s background includes work with magazines & in the fashion industry, and these influences certainly show in her artwork. Her paintings of brightly colored lips are bold and glossy, and each painting embodies a different expression or feeling. “I find lips compelling as a subject matter for a couple reasons,” she told me. Emily Braun: What attracts you to the themes present in your work? Sara Pope: Firstly, I’m very interested in the question, “What is beauty?” The lips are often used and manipulated as a device to portray heightened attractiveness and to seduce. Use of lipstick, fillers, and surgical procedures all have the aim of creating fuller & more youthful-looking lips, something that biologically signals increased fertility. In my paintings, I create a glossy hyper-real version of the lips’ reality, taking this to an extended conclusion. The second reason is that the lips and mouth are integral to communication – not only through speech, but also with the nuances of expression and small changes in the shape of the mouth. We convey a multitude of emotions in this way. When creating my paintings, I always begin with a model and a photo shoot. I often ask the model to mouth different words or expressions or to try to feel a certain emotion, giving me many expressions to work with. Braun: Have you participated in the Moniker Art Fair before? Pope: Previously, Jealous Gallery took part in Moniker and represented my work. I visited the fair, and I was very impressed. This year, my originals will be represented by Hawkins & Blue Gallery. Braun: So I found your work because you incorporated Bitcoin into one of your paintings. How did you first learn about Bitcoin? What are your general thoughts on it? Pope: I first heard about Bitcoin a year or so ago. Before Bitcoin, it seemed that people were helpless in the face of banking institutions being able to break the law without consequence – or even supported by the government. So this returns power to the individual, to choose an alternative. 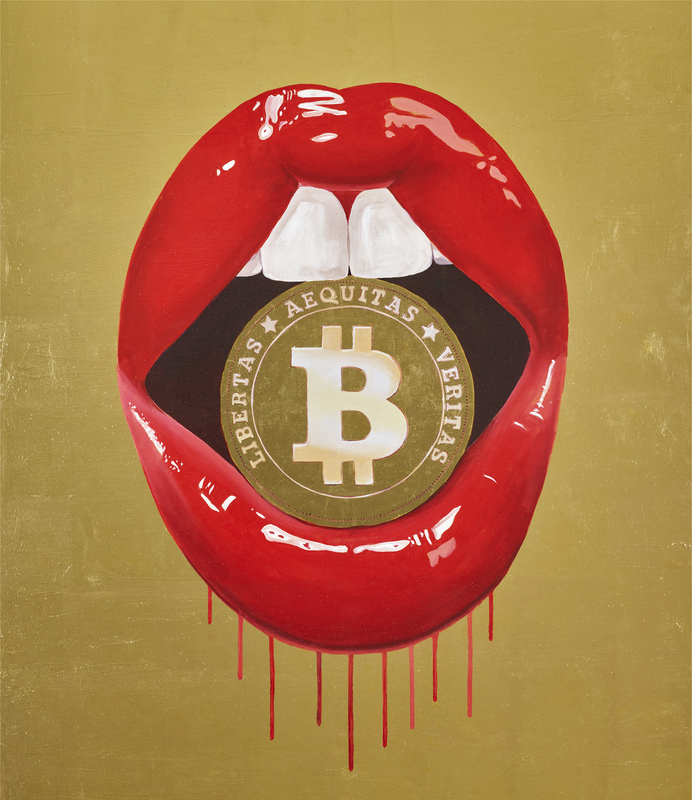 Braun: How does Bitcoin fit in with the topics that you typically explore in your paintings? Pope: Bitcoin as a subject matter is a bit of a departure from my usual themes, but I do like to address subjects every now and then that I feel are important in our social zeitgeist, such as my Pope Francis portrait last year. When I heard that Moniker was to be the first art fair to accept Bitcoin as a currency, I felt it was the perfect opportunity to paint a new piece depicting Bitcoin. The finished piece will be showing at Moniker with Hawkins & Blue Gallery. Moniker Art Fair opens Thursday, October 15 for a Private View. The fair is open for regular hours from Friday, October 16 to Sunday, October 18. For more information on visiting, please click here. To purchase a ticket to Moniker with Bitcoin, click here! The featured image for this post is Faux Ever by Sara Pope.